Needless to say, eCommerce business has taken the world by storm. At this present digital era, the eCommerce industry is in its boom and that is the reason why more and more people are considering to start their own online business, to earn lucrative profits. Among typical eCommerce stores, the dropshipping stores work similar to ecommerce stores but instead of packing and shipping the products themselves, the dropshippers forward the orders to a manufacturer who then takes care of the delivery process. This kind of stores allows business owners to make significantly more profits as compared to the actual eCommerce store owners. How to Make Money with AliExpress Dropship Store? 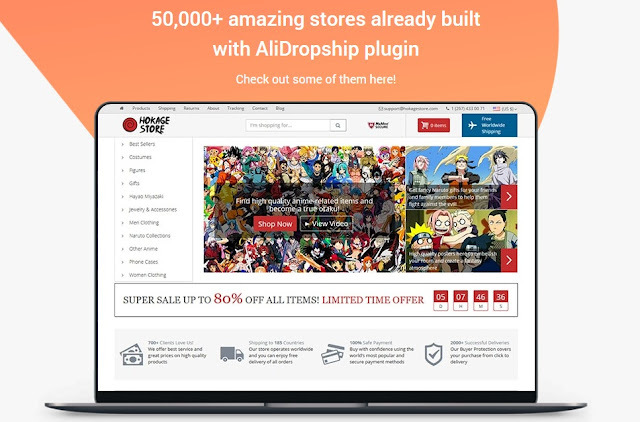 When you will use AliDropShip Plugin, it will help you to easily import and edit AliExpress Products to your own Dropship Store and automate the dropshipping process. A product sold on AliExpress might cost $5, while you will add up certain percentage of profit margin on products sold at your dropship store. Let’s suppose a product’s price on AliExpress is $5 and you can easily sell it for $8 or more. This way, you will make a handsome profit. Your order will be forwarded to the manufacturer or wholesale supplier of that product, who will handle the shipping and delivery of product to end consumer. So if you are looking how to start a dropshipping WooCommerce Site with WordPress AliDropShip Plugin, we have got you covered. It automatically searches for the products that are available at the lowest cost. So, in order to get these benefits, you need to purchase the plugin which comes in two different versions – one for WordPress and one for WooCommerce. We recommend using WordPress AliDropShip Plugin that will offer you everything you need. Once you purchased the plugin, you will receive a license key that allows you to update the plugin page. From this page, select your desired details and click “Download Button”. The first thing that you need to set up the Dropshipping store is to set up your WordPress Site or WooCommerce Store. You should have your domain name & web hosting solution to setup WordPress or WooCommerce Dropship Store. If you are not familiar with these terms, you don’t have to worry at all. We will arrange and manage every requirement on your behalf. Our valuable clients are recommended to use MT Web Sol’s Service for WooCommerce Store Setup, because we ensure the timely delivery of WooCommerce Store, that includes premium design, secure ssl padlock and lots of more recommended tweaks. If you have already purchased the AliDropship Plugin, we can help you setup your entire store. Get in touch with us today. If you don’t have AliDropShip Plugin, please make sure to obtain it’s license by purchasing it and download the plugin file to your computer. Now the next thing you need to do is go to your WooCommerce Dashboard > Plugins > Add New and upload the zip file that you have downloaded to your computer. Next, upload your plugin and click on the install now button to activate it. After that, the AliDropship Woo tab will appear in the sidebar menu within the dashboard. Here you will need to add your license key and click the Activate Button to get started. You will get a message that you have successfully setup your WooCommerce dropshipping store. Now after setting up the plugin, you need to install the AliExpress Extension to start searching and adding products to your store. After installing the plugin, connect AliDropShip plugin and extension by clicking “authorize to connect” both the plugin and extension. There are two importing methods – Direct Import Method and Import from the list method. The Direct Method allows you to import products in a category of your choice while the Import from the list method lets you import products in the list from where you manually place them in the categories. You will probably need a Google Chrome Extension for AliDropShip. After importing the products from the AliExpress Store, you can now edit the products categories, their names, their pictures and add descriptions, pricings, and variations. After editing and customizing the products, click “Publish” button to finally make the products appear on your website. Now check your AliExpress Dropship Store, the product has been imported successfully on your store. You can add up several payment gateways such as PayPal or Credit Card on your store, to process the dropshipping orders. Was this guide helpful? Let us know what you want more in the comments below. This entry was posted in News, Wordpress Plugins and tagged AliExpress, Dropship Business, Dropship Store, Dropshipping, Setup Dropship Store, WooCommerce, Wordpress.